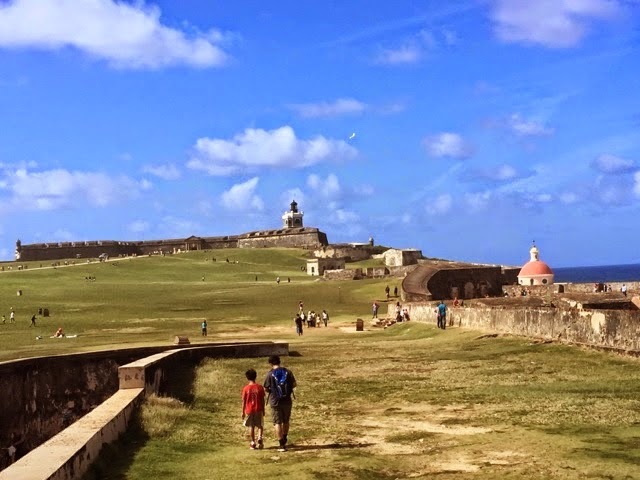 Day 3 in Puerto Rico, Jon and Dad walked on the huge ground of Old San Juan Castle El Morro, one of the greatest fortresses in human history that was built by Spanish colonizers over the course of 400 years. Dad: Imagine you worked here 400 years ago, how can you stand out among five thousand laborers who were building the castle with stone cutters and chain saws? Dad: How about shouting out at the end of an exhaustive day:"Let's continue to work for another eight hours?!" Dad: OK! How about inventing a new method to cut stones that improved the efficiency by 50 percent? Jon: How about getting a machine from Home Depot?